He is Yugi’s main rival, and an extremely good duelist. He is the Duel Monsters World Champion, and has only lost three times in his life. He loses to Yugi before Duelist Kingdom because of Exodia, he then loses again to Pegasus, and finally loses in the Battle City semi-finals to Yugi. While extremely cold on the exterior he has a soft-spot for his little brother Mokuba. Seto inherited Kaiba Corp from his father that adopted him. The Kaiba brothers were adopted when he beat Kaiba Corp’s former chairman at a game of chess. Kaiba’s “father” trained him to be cold, which is what turned out to be Kaiba today. 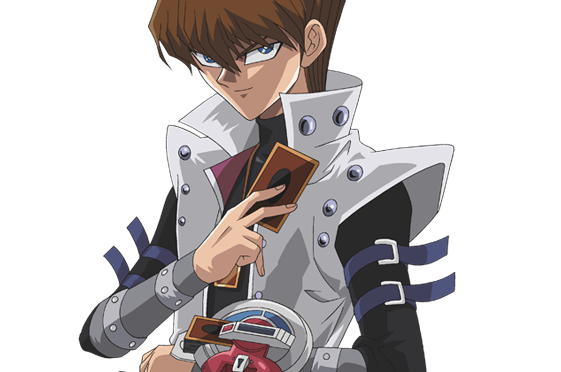 Seto Kaiba goes to the Duelist Kingdom to rescue his little brother Mokuba, when Pegasus kidnaps him in a plot for the “Big 5” to take over Kaiba Corp. After the duel with Yugi, in the Duelist Kingdom, he is seen dueling Jounouchi, and then duels Yugi again to gain entrance to Pegasus’ castle. Kaiba wields the mighty Blue Eyes White Dragon, and although people think its the strongest non-fusion card in Duel Monsters, it is far from it. When Kaiba duels Jounouchi to test out the prototype Duel Disk system, Kaiba horribly beats Jounouchi even though Jounouchi started to make a comeback with Red Eyes. Then Pegasus forces Kaiba’s hand, and Kaiba must then duel Yugi for entrance into the castle. At the beginning of the duel, the match is pretty even with Kaiba summoning Lamp Spirit: Ra Djinn (English: La Jinn) and Vengeful Swords talker (English: Swords talker), while Yugi used his Curse of Dragon and Black Magician (English: Dark Magician). Kaiba then plays his Saggi: The Dark Clown / Deck Destruction Virus of Death (English: Crush Card Virus) combo, infecting Yugi’s deck for the remainder of the duel (Note: In the CCG, it only infects your deck for three turns). Kaiba then fuses all three of his Blue Eyes White Dragons into Blue Eyes Ultimate Dragon, one of the most powerful duel monsters in existance. Yugi counters with the ultimate defense, using a Kuribo / Multiply combo. With that, Yugi fused his Mammoth Graveyard into BEUD, reducing BEUD’s attack by 1200 each turn. When Yugi finally weakened it below 1400, he summoned Retrained Elvish Swordsman (English: Celtic Guardian) and killed one of the BEUD’s heads. Kaiba went to the psycological game and threatened to jump of the castle if Yugi won the duel. Yugi conceded and lost the duel. Kaiba then loses to Pegasus in their duel to settle Mokuba’s fate. Pegasus’ use of Toon World, and then his use of the Copycat (English: Mimicking Illusionist) to copy Kaiba’s Deck Destruction Virus of Death card, was too much for Seto in the end. Pegasus then trapped Seto’s soul in a card, like Mokuba. Yugi then went on to defeat Pegasus, thus releasing Kaiba’s soul. After the Duelist Kingdom ended, Kaiba turned his wrath on the Big 5. They challenge him to a virtual game, and with Yugi, Jounouchi, and Mai’s help he wins. This is where the two most powerful cards in the game are revealed, The Five-god Dragon, and the Master of Dragon Knight. After this ordeal with the Big 5, Kaiba is given the god card, Obelisk, by Isis Ishtal, so an organization called the GHOULS don’t achieve getting all three-god cards. Kaiba then sets up the Battle City tournament to attract the controllers of all three-god cards to the tournament.